My collection of eye tubes has shown me that there is a lot of variation in the physical construction of tubes, even of the same type number. The electrical characteristics remain the same for the most part, although I have seen some variations in the past. Below are a few different things that deserve note. I find that the target area of older generations of magic eyes generally have a rougher surface than newer ones. I don't know if this is a result of different manufacturing techniques, or if there was an intent to increase surface area in order to increase brightness or life of the tube. 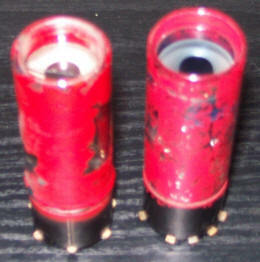 Below, the left tube is a WARDS brand 6E5 (ST), while the right is a newer RCA brand 6E5. The grainy surface of the WARDS tube caught my eye (no pun intended) because I was not used to seeing this. As I looked through my collection, however, I did notice a variation of textures on different tubes. I remember breaking a 1629 tube from an EICO signal tracer. With this tube, I could wipe the fluorescent coating off of the target with my finger, much like phosphorus from the inside of a fluorescent lamp. About that particular 1629 tube, I remember a brighter tube than normal (even with only 200 volts on the plate), and more of an aqua color rather than the green I usually see on the 1629. 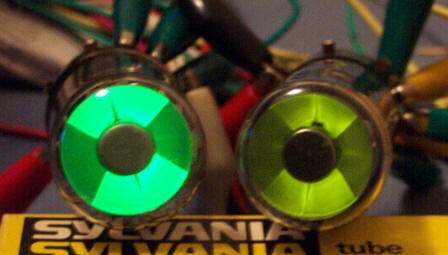 The color was comparable to that of the 6FG6, where the luminous area is on the glass of the tube. The physical length of the tube was also shorter than the others I have, but that was no surprise since the length of the tube and the distance from the target to the glass viewing area is probably the most common of the physical differences seen. (see above tubes). The 6T5 is probably the most expensive and hard-to-find of the American indicator types. I only have a few of these (one is in a radio), but I discovered something very different about one of them. Below, the Left tube is a Raytheon brand 6T5, while the lower is the ZENITH brand 6T5. From the front, not much is different. From the side, the first thing I noticed is the shape of the target. If you considered a cross-sectional view, the target of the RAYTHEON is shaped like most of the common eye tubes, that is to say, cylindrical at the outer edges for the first 0.1" or so, then conical at a 45° angle to the base of the target. The ZENITH tube, however, has a semi-spherical target, as if a hollow metal ball was cut in half, each half to be a target. I later found that many foreign eye tubes took a liking to the semi-spherical target. The typical target diameter is .875", and the filament shield is .375". This 7:3 ratio is pretty much standard with American types. Foreign types, however, have been more flexible in each direction with this figure. Also, many of the foreign types have filament shields that are rounded, which is something I have never seen on an American magic eye. Some of the filament shields on foreign tubes protrude past the target. The glass envelope on some foreign tubes is recessed in towards the target. I have heard this type of construction referred to as "dished glass". I don't know for sure, but I assume the intention would be to shade the target area from external light, therefore improving visibility. I gave a second glance to a 6AF6G twin indicator when I noticed that the filament shield was glowing violet. I don't think this was intentional; probably just a tube that has some extraneous gas inside. I do however have an EM4 with a yellow target opposed to the typical green we are all used to seeing (below). I have heard of a reddish-orange target on an eye tube, but have yet to see one. Schematic symbols used to designate magic eye tubes also vary, depending on who drew the schematic, where it was drawn, and when it was published. I have been unable to find any documents that explain when and where standards came from regarding schematic symbols for the various elements of the vacuum tube. All three symbols shown below were used to designate the 6E5 in either a schematic diagram or a tube manual. Through my own experimentation, I have found that the sensitivity of the triode portion of magic eye tubes vary from tube to tube even among new tubes from the same lot. As corroboration, I have a batch of Japanese tubes, each tube having its own "data sheet". They were individually tested and labeled with the data recorded during testing. Below is one of the sheets that were packaged with the tube. Lastly, it is not uncommon to see a defect in the display portion of the magic eye. I have seen on several occasions a tube with poor symmetry of the indicating pattern caused by a bent or off-center control vane. I have a few tubes with the filament shields bent or off center, and one tube with a target that looks like it was pinched prior to vacuum, giving it a slightly oblong shape.